The process of color vision unveils several interesting facts about color and our perception. For one that perceived brightness (luminance) is the predominant visual information we rely on for orientation and to identify objects. We also learn why all individuals perceive color a little different, or no color at all. Furthermore we get hints that might explain why certain techniques of combining colors in compositions have certain effects. Color perception is a result of achromatic and chromatic signals derived from light stimuli. Chromatic signals (~ hue) are mostly derived from the light's wavelength. Achromatic signals (~ lightness / grayscale vision) are mostly derived from the light's energy at a certain wavelength. The eye has photoreceptor cells, called cones, which we divide into three types. S-Cones are sensitive to short-wavelength light ("blue"). M-Cones are sensitive to medium-wavelength light ("green"). L-Cones are sensitive to long-wavelength light ("red"). Each type of cone is less or more stimulated by a light beam and passes on its stimulus value. 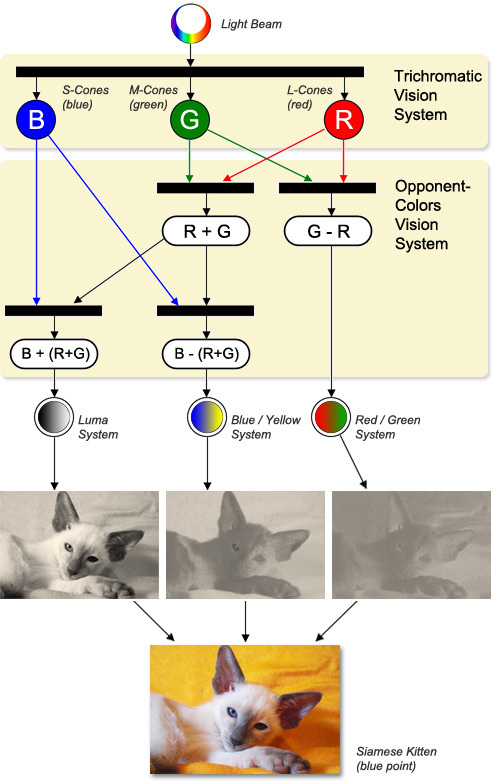 (~ range from black to white, or dark to fully illuminated respectively), the blue/yellow system and the red/green system. An interesting aspect of cones is their different sensitivity in regards to wavelength. The exemplary illustration on the right shows the sensitivity curves for each type of cone. We see that cones react to a wide range of wavelength and how their curves overlap. We can also see that sensitivity-peaks are not evenly spaced. This demonstrates that for most wavelengths we need the input of all three types of cones to distinguish changes in wavelength and/or intensity (number of photons). Furthermore, the illustration provides evidence that the medium- and long-wavelength cones contribute the most to our brightness perception, if we consider the formula of the luma system from the above: L = B + (R + G). The physiological prerequisites for color vision allow drawing the conclusion that there is no uniformity in color perception among individuals. Several physiological deviations can cause a shift in color perception. For individuals with "normal" vision these shifts can be hardly measured. Less fortunate individuals suffer from significant shifts in color perception, called color vision deficiency or "color blindness". Most of the times this is caused by cones which are defect, absent, or altered in their spectral sensitivity.